Origin: USA. Sterlings pedigree includes Saaz, Cascade, Brewers Gold, Early Green, and other European varieties. It was released in 1998 as a higher-alpha replacement for Saaz with improved disease resistance and storability. Usage: Dual purpose: although primarily used for its exciting, pleasant aromatics, Sterlings alpha acid levels can contribute in the kettle as well. A good choice for hop-forward lagers, Belgian ales, and other continental styles. Aroma & Flavor Characteristics: Moderate and pleasingly hoppy. 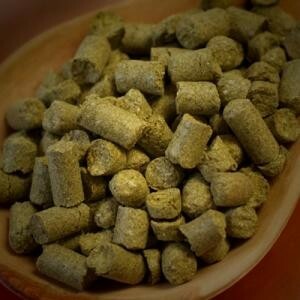 Prominent herbal quality reminiscent of Saaz, with flashes of candied citrus, sweet grass, bright spice, and dried hay.